This building was constructed as a home for the elderly by the Security Benefit Association. Building "C" was opened July 13, 1925. The S.B.A. 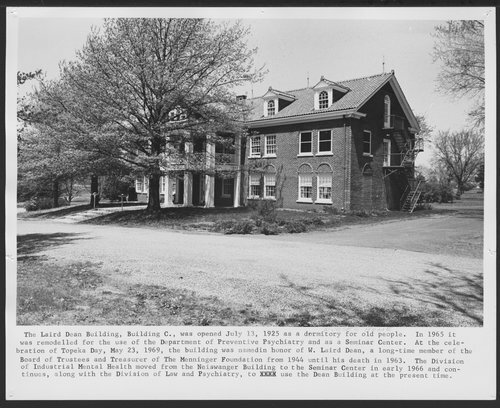 property was purchased by the Menninger Foundation, and in 1965 it was remodeled for use by the Department of Preventive Psychiatry and as a Seminar Center. At the celebration of Topeka Day, May 23, 1969, the building was named in honor of W. Laird Dean, a long-time member of the Board of Trustees and Treasurer of The Menninger Foundation from 1944-1963. Later the Dean Building was used as a canteen and for music therapy. The piano for the music therapy room was hoisted through the window.